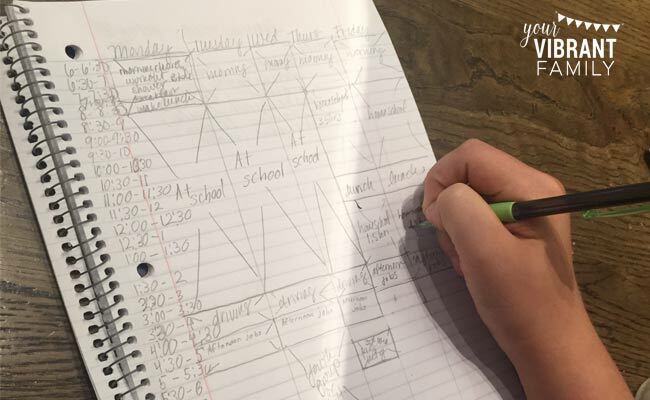 In an effort to teach my kids time management skills, this year my children are managing their own schedules. Sound crazy? Maybe. But the truth is that everyday our kids get one step closer to adulthood, and that as good parents, we must slowly hand our children the reigns to their life. I want my children to learn the life skills they need to survive as successful adults, including goal setting and time management skills. Don’t you want your kids to experiment with important life skills like time management while you’re there to guide them through it? I do. And what better time management activity for kids than to teach them how to create a realistic weekly rhythm and daily schedule? Do you want to teach your kids life skills like goal-setting, commitment and time management? If so, then I encourage you to come up with your own set of reasons why you want your kids to develop these life skills (because, truthfully, they’re not easy to teach). Just like us, it takes lots of perseverance and practice to teach kids time management, and there are days when you’ll need to be reminded why you’re doing this. I want my kids to experiment firsthand with the power of saying no to one thing so they can say yes to something else. I want my children to see how much free time they really do have, and how to best use that free time wisely (one of the enemy’s tactics to keep kids from experiencing true purpose is to keep kids distracted with meaningless activities). I want to teach my kids how to build successful habits into their everyday routines, and how those little habits produce big results. I want them to have input to their daily rhythm so they have more respect for it and are more likely to follow it. I want to show them that schedule and routines serve us, not the other way around. Man, I wish someone had taught me these things when I was kid! I had to figure out much of this on my own as an adult. How about you? What reasons would you add to this list? Every child is different, but my view is that if they’re old enough to read well, then they’re old enough to start learning how to manage their time. Of course we can give our younger kids (or kids who have never had a routine) much more help and guidance. 2) Give them time management freedom within established boundaries. 3) Let the routine reflect current family expectations. We have some standing rules in our house like “No free time until chores and schoolwork are done.” So while we do give our kids freedom to figure out their own day, their routine must live within those confines. 4) Model good routines and goal-setting in your own life and talk about it with your kids (the failures and successes). 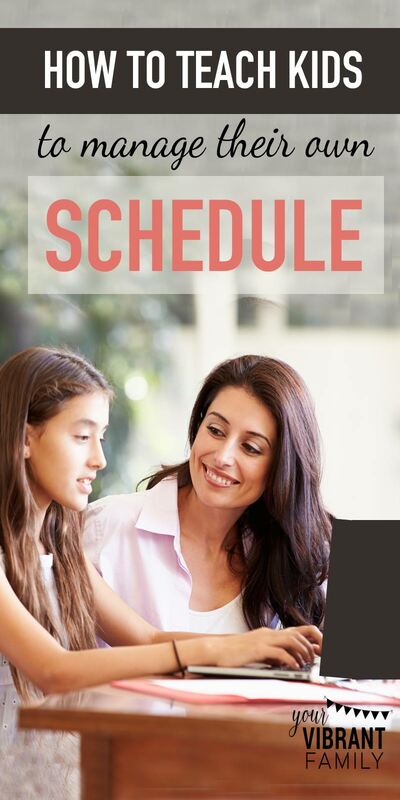 When I meet individually with my children to teach them about time management, I bring a copy of my own schedule to show them how it helps me. They can see how a routine helps me handle all our family’s responsibilities and even make time for important personal goals like daily Bible reading and exercise. 5) Realize that time management is a learning process for kids too. This is an experiment! Your child may not follow their time management routine perfectly (especially at first) and that’s fine. I honestly don’t follow my schedule exactly because everyday is a little bit different (that’s why I like to think of it as a “rhythm” instead of a schedule). If a child gets off track, I just keep encouraging them to re-consider their time management and to see how to best plan for what’s happening in their lives. 1) Take your child on a fun but brief mother-child date. Ask him to grab a pencil and lined paper and tell him you’re going somewhere special (you’ll want to grab a laptop too if you have one). Of course you could take him to a quiet corner of the house (if your house has one… mine usually doesn’t!) to work on this. But I like to take my kids individually to a coffeehouse and set up camp there to make it more of a special occasion. It also helps set a celebratory tone that says, “You’re growing up and I’m so excited for you to have this freedom!” which goes a long way for a kid. Plus it’s way more fun for anyone to talk about schedules with a yummy coffee drink in hand, right? 2) Help him identify his goals/activities for the year. Some of these things will be obvious (and perhaps not so glamorous): school, household responsibilities and perhaps sports/music practice. Some of those activities may be influenced by another sibling (for example, he may have to tag along to his sister’s gymnastics practice on Tuesdays because there’s no childcare for him elsewhere). Either way, help him list all of this out on a piece of paper. 3) Teach him why time management is important. I tell my kids that a routine is simply a plan to meet our goals placed within the realities of our day. It’s not set in stone, but it’s a framework that turns dreams into accomplishments. At first, it may seem that a daily rhythm may seem confining, but really, having good time management skills is a powerful way for us to set boundaries that protect our priorities. I also share that it becomes easier to say yes or no to certain activities in our lives because we can see on paper if we realistically have the time to make that commitment. ASIDE: Moms, a child-created schedule like this can also save us future heartache (and quickly end arguments)! If a child asks to participate in a new activity and we have to say no because of time commitments, our kids can better understand because the schedule shows that we literally have no time to add in that new activity. Hurray for (hopefully) less arguing! 4) Create a paper version of your child’s routine. In the left hand column (before the red line of the paper), write the hours of the day (starting whenever they need to wake up) in half-hour segments. Give each half-hour segment (6:00-6:30, 6:30-7:00, 7:00-7:30, and so on) its own row in the column. Then across the top, list the days of the week (one for each column). Next, reserve time for each activity by creating a sectioned-off block of time for each area. Start by filling in those non-negotiable things that have a fixed start time (school, for example). Then add in chores and other responsibilities (in our home, this includes time for daily Bible study). Lastly, show kids where the open spots are and ask them how they’d like to use that time. (If at all possible, have your kids do this so that they can really feel like this is “their” schedule). Erase, rearrange and work it until you and your child are happy with how the time is spent. I always make sure to point out just how much free time they really do have to explore and play if they are able to stay on schedule… because it’s usually a lot (especially for the younger kids!) This alone motivates them to want to start following their schedule! 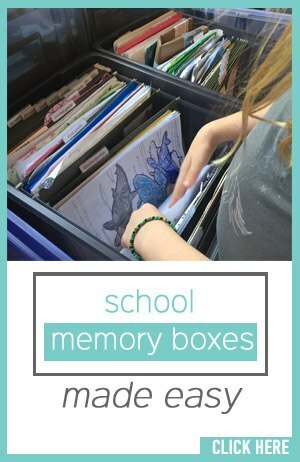 5) Teach him how to create a simple spreadsheet on the computer to manage his time. Here’s my theory: We do all the puzzle-piece-fitting on that original pencil and lined paper and then we plug it into a computer so it 1) doesn’t get lost; and 2) can be easily and quickly modified. Routines are always changing because our family’s lives are always changing, right? 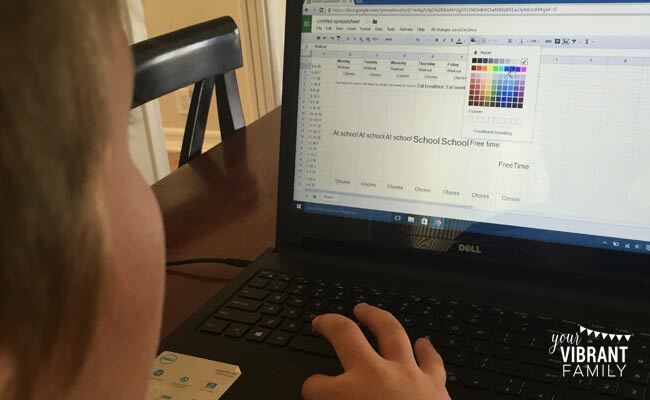 Make it easy on yourself and your child and keep it on a computer spreadsheet. That’s why I don’t use some of those adorable printed paper schedules on Pinterest. They’re cute, but they’re not practical for the long haul because they don’t allow you to make modifications. Anyway, I show the child how to re-create the same document in a computer spreadsheet–how to create the times on the side, the days at the top, and how to create time blocks by merging cells and using color. I let the child add most of the info into the spreadsheet later on his own time, or, if he’s not old enough to do it independently, we work on it together right then. 6) Post a copy of the schedule(s) in a high-traffic place of your home. 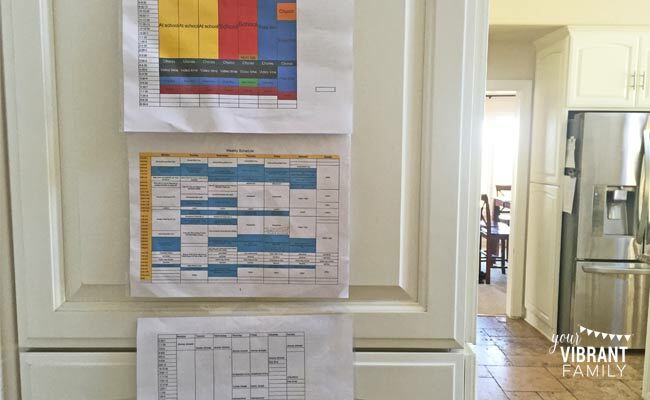 Our schedules hang in the kitchen so that we can all see where everyone is supposed to be at a given moment. It helps us all stay focused and doing our best to work toward our goals throughout the day. 7) Check in with your child regularly to see how his time management skills are developing. Once the schedule has been created, give it a week or two to see how it’s going. Again, rhythms are always changing, and a routine should serve us, not us serve it. Ask the child questions like: Do you have enough time for XYZ? Have we added in new things? Do you feel like you’re on track to meet your time management goals? 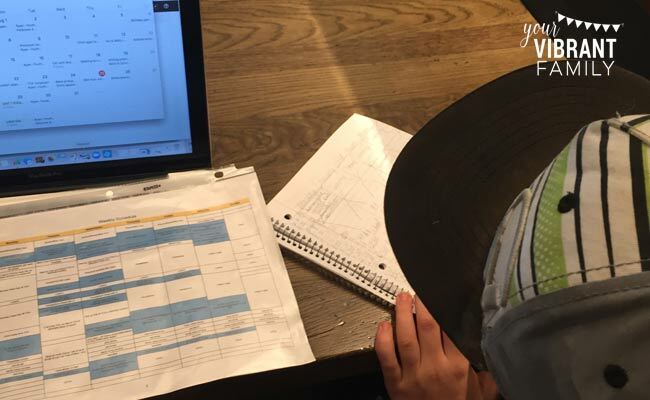 Help your child tweak and adjust his time management as his routine and goals change. And if you find that the rhythm isn’t working, go back and completely rewrite it! And that’s it! It’s all a learning process, but teaching your child time management skills really goes a long way in teaching self-management!